Threats from malware, complicated projects, and out-of-date equipment are front and center in executive conversations with Information Technology (IT) support firms right now. This past month, demand for my consulting time has been at an all-time high. As I advise business leaders and managers who are trying to get better results from IT, the first part of the discussion usually consists of defining exactly what IT is. Our country may be going through some interesting times, but the economy is doing well. And when the economy is strong, businesses seem to be more open to hiring. That can put a company like ours in an interesting position. You see, Accent Computer Solutions is a provider of outsourced IT services. If a strong economy means companies are hiring again, you’d think that outsourcers would be in trouble. Luckily, that’s not the case. Not only are we seeing job growth in our business, our clients are expanding as well. Over the course of my business career, I've been lucky enough to meet and consult with a wide range of different leaders, and leadership styles. I'm thankful that I get to be the person that these leaders trust and confide in when they have business performance or employee-related issues. It seems like there are 7 areas all business leaders find themselves dealing with at one time or another. I thought this month I'd share those situations, and how these items could indicate it's time for a change. The Cloud is awesome! Specifically, cloud storage is amazing. Think about it - we can store our files, reports, pictures, and just about anything we want "in the cloud." The manufacturers and cloud storage providers make it SO easy. You just upload/copy the data to whichever cloud storage provider you want, and you can access it from your phone, computer, laptop, or tablet from almost anywhere with an Internet connection. This month, I’ve consulted with four different business executives in varying industries that all share the same frustration. They want better IT results, but after about 90 days of trying, they give up on the people and try something else. Whether it’s simply who to call for support, or as complex as how long it takes to get your files back in the event of a virus, knowing your own IT needs is CRUCIAL. 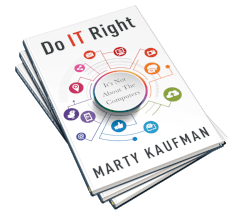 As the CEO, you’re not expected to get into every technical detail – that’s why you have an IT provider in the first place - but every CEO should know enough about IT to make solid IT decisions. You should know how to get the most out of your IT even though it is always evolving. With the help of a few general specifications in each category, you will be on your way to understanding IT. Have you ever taken time off from work to wait for an installer or repairman? Ever been disappointed because your appointment time came and went without someone showing up, and you didn’t get so much as a phone call? No matter who lets you down, the pain of this situation can always be eased with a little bit of good communication. Everyone likes to be in the loop with their particular order or project, especially BEFORE a deadline is missed. I think we all understand that, in service professions, problems come up and the repair time doesn't always follow a normal schedule. It’s hard to estimate how long a morning install or appointment will take. But if the schedule needs to change, a call would be nice. Now's the time to kick 2017 business (and life) planning up a gear! Some of the folks I've talked to already have the plan finished and they're ready to roll. Others haven't even started planning yet. Not to worry! It's certainly not too late - and it's not as hard as it sometimes seems.